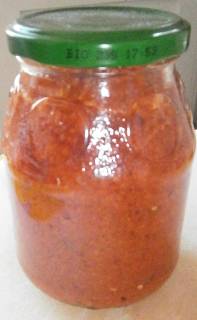 To go with the samosas, I tested this chutney recipe. It is Indian so it is spicy; I think I will never get used to it! What is the chutney? It’s an Indian salsa which is served with many dishes. There are many possibilities, and the one I chose is easy and quick to prepare, but it must rest a long time in the fridge so that the spices perfume the preparation. Ideally, you should prepare it the eve of the day when you will need it. Wash and mix all the ingredients together in a blender. Let it rest some hours in the fridge. For my recipe, I used chilli powder and ginger and coriander in powder, because it can be hard to find everything fresh (1 teaspoon powdered ginger, 1 teaspoon coriander, and ½ chilli powder).